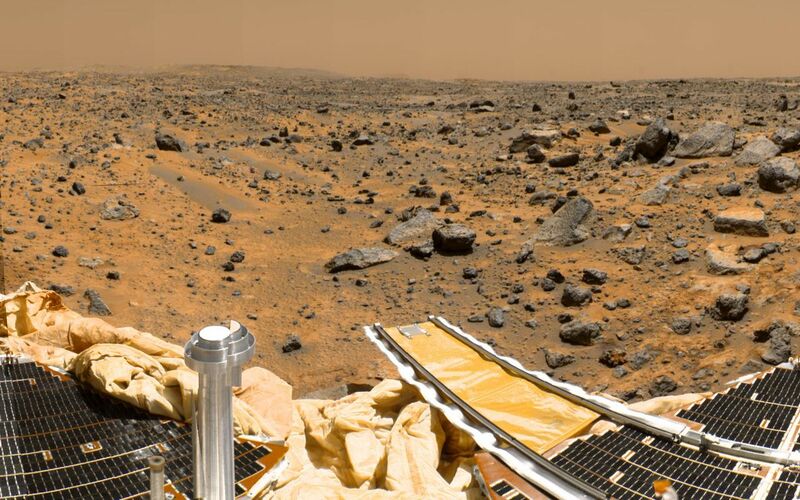 This is a sub-section of the "geometrically improved, color enhanced" version of the 360-degree panorama heretofore known as the "Gallery Pan," the first contiguous, uniform panorama taken by the Imager for Mars Pathfinder (IMP) over the course of Sols 8, 9, and 10. 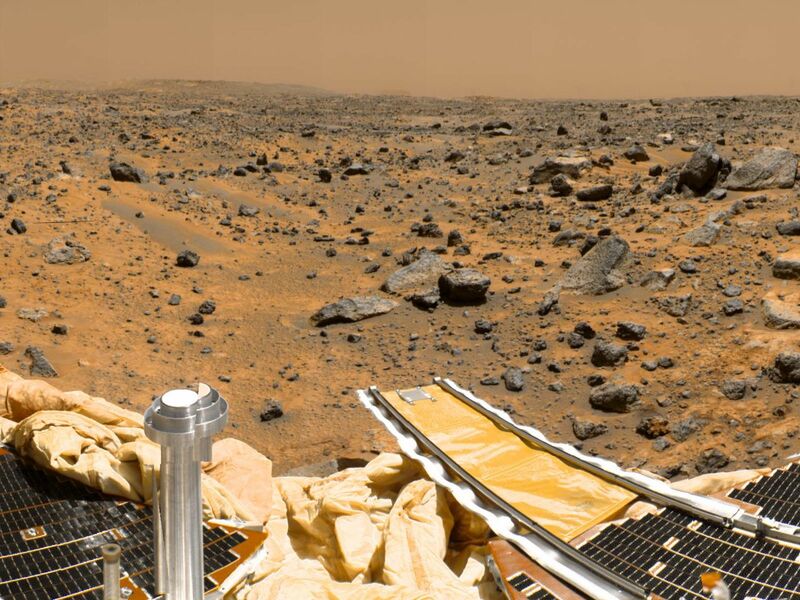 Different regions were imaged at different times over the three Martian days to acquire consistent lighting and shadow conditions for all areas of the panorama. The IMP is a stereo imaging system that, in its fully deployed configuration, stands 1.8 meters above the Martian surface, and has a resolution of two millimeters at a range of two meters. In this geometrically improved version of the panorama, distortion due to a 2.5 degree tilt in the IMP camera mast has been removed, effectively flattening the horizon. The IMP has color capability provided by 24 selectable filters -- twelve filters per "eye." Its red, green, and blue filters were used to take this image. The color was digitally balanced according to the color transmittance capability of a high-resolution TV at the Jet Propulsion Laboratory (JPL), and is dependent on that device. In this color enhanced version of the panorama, detail in surface features are brought out via changes to saturation and intensity, holding the original hue constant. A threshold was applied to avoid changes to the sky. 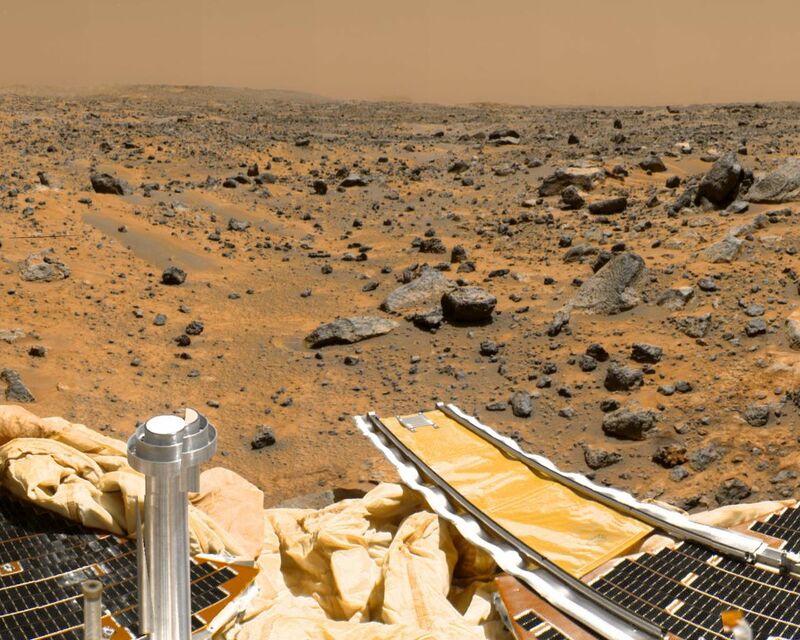 At left is a Lander petal and a metallic mast which is a portion of the low-gain antenna. Misregistration in the antenna and other Lander features is due to parallax in the extreme foreground. Another Lander petal is at the right, showing the fully deployed forward ramp.